Looking for a Blooma Sheds? This is a great looking and durable shed that will blend into its natural surroundings within your garden. Made of low maintenance plastic, this shed would be fantastic for somebody looking for an easy storage solution for their outdoor and garden equipment. The Blooma shed is a low maintenance plastic shed which is rot and rust proof retaining its good looks for years to come. 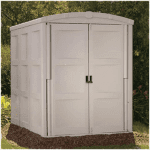 This shed has large, double doors allowing easy transport of all your garden equipment and furniture inside and out. It is roomy enough for plenty of storage and there is a small side window allowing for light inside. It is an excellent product which will look handsome in any garden and makes a real feature of a shed! This comes with a B&Q guarantee and is easy to assemble. This is home delivered. For a plastic shed, the brown plastic aids in blending the shed into natural surroundings, making it unobtrusive within your garden. 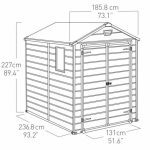 Fantastic for a multitude of uses, this shed would be great for a gardening enthusiast or simply for storage of tools or other garden items. With the added benefit of a padlock door closure, this shed will provide both security and protection for your items all year round. If you have been looking for a new garden shed you may have only been looking at traditional wooden garden sheds and may not yet have considered a plastic shed for your garden. 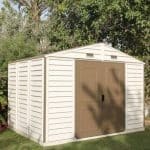 Although plastic sheds are definitely a modern take on the wooden sheds that we are used to, they have many advantages and features that a traditional shed may lack. 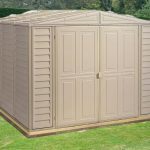 Below the team at whatshed.co.uk look at the many features of the Blooma brown plastic shed and see how it could fit into your garden and lifestyle. Exterior: The Blooma plastic shed will be a smart feature for your garden, with its dark brown colour exterior blending into the natural background. 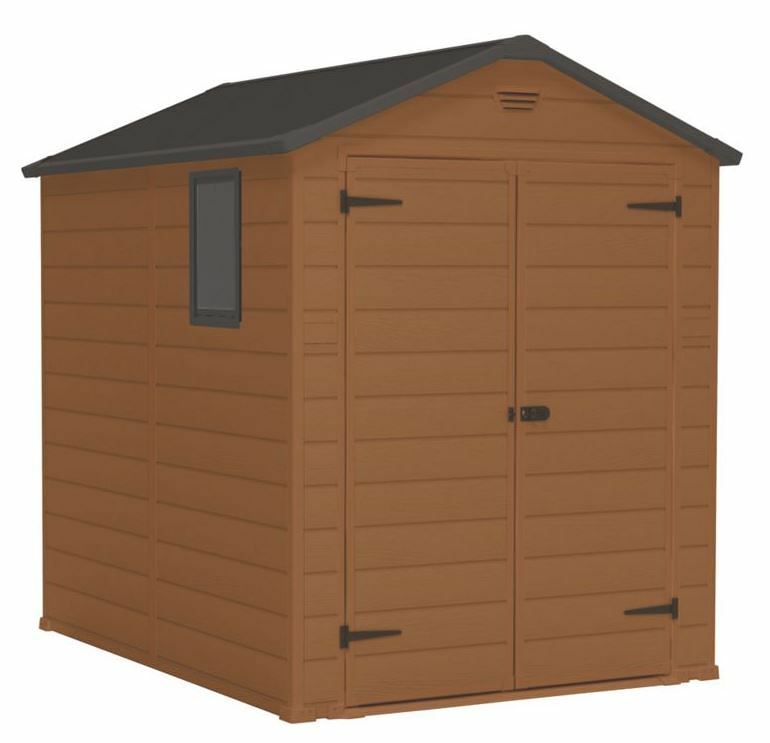 The strong and durable plastic exterior of this shed is left untreated, enabling you to finish the shed with a protective treatment of your choosing. The plastic construction means that your shed will be completely weatherproof, protecting your items against the outside elements as well as rot, rust and mould. Interior: The medium sized interior, measuring 8x6ft will adequately accommodate the average family’s outdoor and garden equipment with ease. 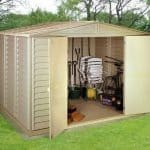 From lawnmowers to bikes, you can store it all within this fantastic shed. Double doors: The large double doors allow you to store larger items with ease. Opening the doors, you can view the entire contents of the shed and easily find what you are looking for. Window: The small side window allows light to enter the shed interior. Security: The sturdy padlock door closure adds an element of security to the shed, giving you peace of mind that your items are safe whilst not in use. 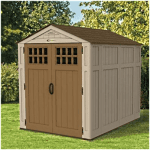 Blooma Brown Plastic Double Door Shed: How easy to build? Love gardening but nervous about undertaking DIY projects? Fear not, as the Blooma plastic shed is easy to assemble. We recommend that you set aside one full day for the assembly of your new shed. 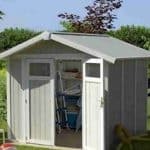 Whilst most of the shed is easily assembled by an individual, certain stages may require a DIY partner simply because there are large parts to handle or height is an issue. Your Blooma shed will arrive directly at your door flat-packed with all the necessary fixtures and fittings for assembly. An instruction manual is provided with detailed instructions and easy-to-follow diagrams to keep you on track every step of the way. 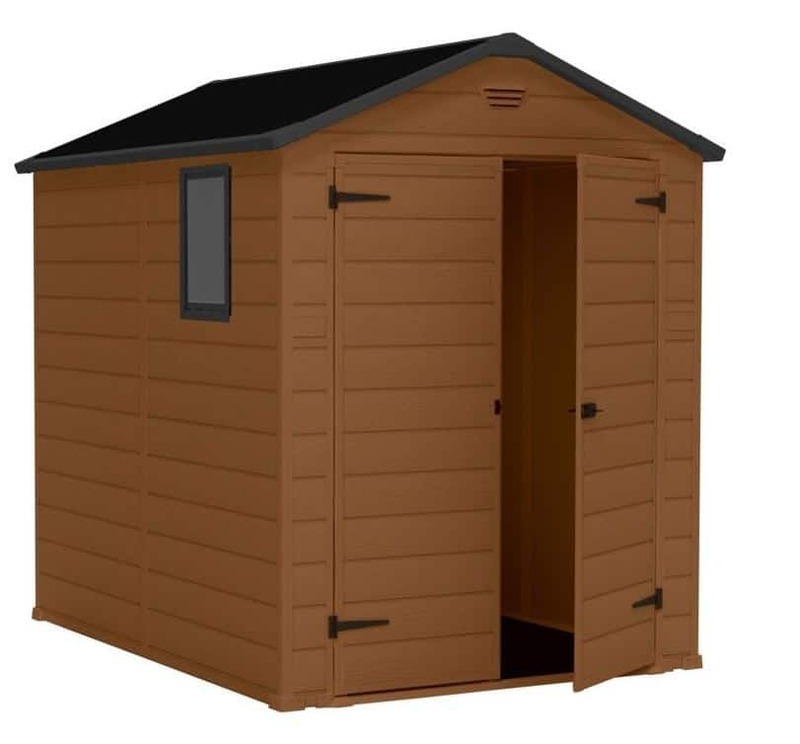 Blooma Brown Plastic Double Door Shed: What is the overall quality like? Blooma sheds and accessories allow you to enjoy and make the most of your outside space all year round. With their stylish, eye-catching designs, you can be sure that Blooma products are of the highest quality. Plastic sheds can sometimes be a bit of an eyesore, especially when they are in an unnatural colour for a garden space, however the brown tone of this particular shed makes it much more pleasing to the eye and unobtrusive within your garden. The quality of the materials used are superb, with everything designed to suit it’s purpose and to a high specification. A fantastic, low maintenance shed suitable for a range of needs, if your shed is in need of a clean then simply hose down or sponge wipe with water. Due to the finish, the colour will be just as vibrant in five years’ time as it is today. If you are looking for an easy-to-use shed that is low maintenance then this Blooma plastic shed could be the answer. The tough plastic ensures that your items are kept protected from the elements and the in-built padlock door closure keeps your items safe and secure. 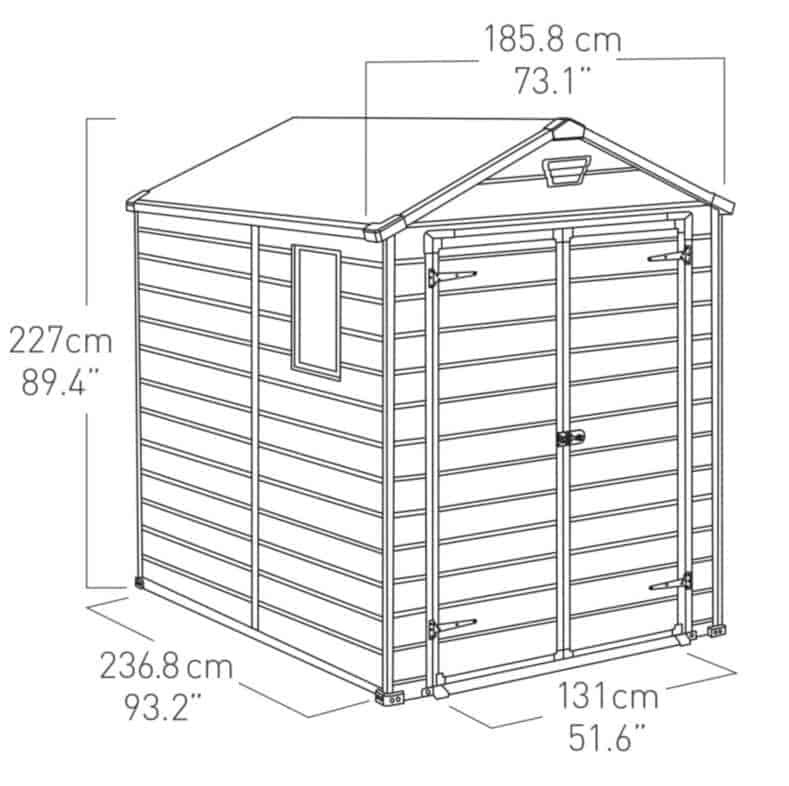 At this mid-range price, this shed proves great value for money considering its long life within your garden. 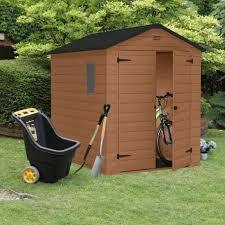 Your shed will be accompanied by the B&Q guarantee of complete satisfaction or your money back. I have been wanting a outdoor storage unit for years. My husband was searching online and he came across this one. I was glad he found one like this. It is really nice and we will be able to store seasonal things in there. I wanted a plastic shed, and this one is so stylish. I like the color of it and the best part is it requires low-maintenance. It is nice for people who work all of the time and don’t have a lot of time to spare. I like the two front doors on this plastic shed. I’m glad my husband was able to find the plastic one so stylish. It is hard to find one that is nice, but is still plastic. I didn’t want the wooden one because we already have a small wooden one and I wanted something different this time. I like the size and the cost of this overall. Took about six hours to put up. Found instructions ok and all parts where labelled. Would say if using a power drill and screw driver bit, take care not to slip as you will go straight through the shed. It is also a sod to get started in a small wind so if it a good wind would not even try till it was calm. It dose fit together ok but really need two people as if you get bottom in then try to get top half in the bottom will come out if not held by a mate. The roof is fun and you really need to make sure that all the edges are right up to the edge of the trim and there is a lot of flex in there so you need to push it in every time you screw it in. I was gentle with it as if you hit it I think it may snap. I did use a rubber mallet on the roof to get the corner bits to fit on out side. And I found that plastic tool they gave us very handy. Best advice is take your time make sure it is in as far as it will go before screwing and if a real pain in the arse take a tea break lol. Thanks for your comments. They should help a lot more people make a decision on deciding if they want to buy this! I am satisfied with this shed because it is low maintenance. I like that is also rust proof. Usually when you have things a while, they can develop rust and fall apart, especially with the rain. Because of how this was made, there is no way that rust can form. I keep all of my gardening tools in there. It is easier than leaving them scattered around and getting broken. My mom needed a shed to keep her gardening things, plus her pool accessories in. I bought her this one because I thought it was just the right size. When my mom seen it, she couldn’t believe I did that for her. She thought it was perfect. It was a little more than big enough, so she found other things she could add to it. My mom is into sunlight big time, so she loves how there is a small window in there. When she is in there organizing, she can still see the sunlight. I forever love these blooma plastic sheds.